Fashion Style - Who says that shoes do not represent people’s expressions? Shoes are a representation of the wearer’s mood and it is always counted as a fashion. 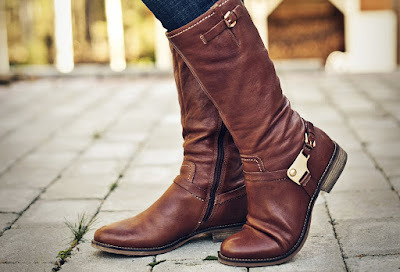 You must read article about boots with studs for new generation, As an old movie, Forrest Gump, says “My mama always said you can tell a lot about a person by their shoes, where they going, where they’ve been.” Say thanks to Forrest’s Mama. Shoes represent an idea of what the wearer going to do, go or where they have been. You will not use a pair of high heel for a long walk. You’ll choose boots or at a pair of sneaker. But that’s how we put the right thing to the right place, so how about showing your characters on it? Here we go. Despite of their actual function, shoes can really show your expression. For examples, sneaker. Sneakers are always great to be used in an informal occasion or at least in a semi-formal occasion. But some are quite brave to pair that with suits. Is it okay? Some will judge as usual but that’s your style. Sneaker is a symbol of being free and not to mention painted sneakers which have a lot of urban style. How about boots? A cowboyoutfits with boot will always great but will you make another shoot? Use a dress or shirt with calm and soft color. Jeans are their soul mate, they’re inseparable and always look great together to show the elegant of long traveler.